Op deze pagina treft u een voorbeeld overeenkomst Engels ZZP. U kunt het voorbeeld downloaden en aanpassen naar uw situatie. Bekijk hieronder een voorbeeld van een Engelse overeenkomst van opdracht. U kunt de voorbeeld overeenkomst onderaan de pagina downloaden. 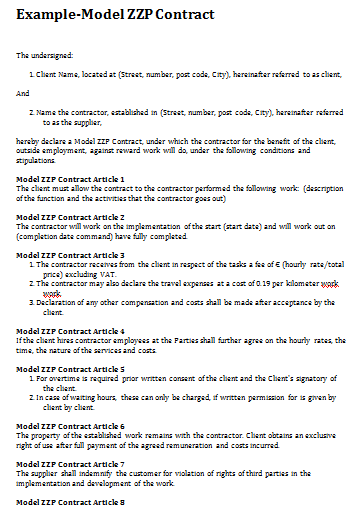 hereby declare a Model ZZP Contract, under which the contractor for the benefit of the client, outside employment, against reward work will do, under the following conditions and stipulations. The contractor will work on the implementation of the start (start date) and will work out on (completion date command) have fully completed. 1. The contractor receives from the client in respect of the tasks a fee of € (hourly rate/total price) excluding VAT. 2. The contractor may also declare the travel expenses at a cost of 0.19 per kilometer work work. 3. Declaration of any other compensation and costs shall be made after acceptance by the client. If the client hires contractor employees at the Parties shall further agree on the hourly rates, the time, the nature of the services and costs. 1. For overtime is required prior written consent of the client and the Client's signatory of the client. 2. In case of waiting hours, these can only be charged, if written permission for is given by client by client. The property of the established work remains with the contractor. Client obtains an exclusive right of use after full payment of the agreed remuneration and costs incurred. The supplier shall indemnify the customer for violation of rights of third parties in the implementation and development of the work. The supplier undertakes to absolute secrecy with regard to all information about the client, the client's mission and Client, which under perform every assignment based on this Model ZZP Contract as well as the hiring out Message. For infringement of confidentiality the contractor to the customer forfeits a immediately payable fine and all of a sudden without summons or notice big € 5.000,-per breach, without prejudice to the obligation to pay full compensation if this amount should fine more than reported. Cumulate compensation and fines, the supplier is not entitled to set off of this. Billing takes place on the basis of signed timesheets. There is a time limit for payment worked with 30 days of the invoice date. 1. On this Model ZZP Contract is the Dutch law is applicable. 2. Any dispute concerning the emergence, the interpretation or implementation of this agreement by the competent court in the District of Rotterdam will be settled. Thus agreed and signed in duplicate at (place) on (date). Download de overeenkomst Engels ZZP.